After taking a broom to a mosquito the size of my fist on our newly painted wall, I decided to look into natural ways to get rid of these pests. I live near a wooden area with a stream. I have a lovely porch that I plan to use throughout the warmer months in the evenings, but don’t want to be eaten alive as I relax. So far I’ve found several options to try out on my property. Also known as fever or citronella grass, lemongrass can help with problematic munchers aka mosquitoes. You can start lemongrass from seed or you can buy the plant. Lemongrass works well in pots or in a sunny and spacious area. Most people prefer growing from propagation because growing from seeds takes much longer. They will spread so anticipate the need for some space. Although very tolerable to hot and humid climates, you will need to water the lemongrass frequently. With such pretty fuzzy flowers, why not have a few in the garden? The flowers are tassel-like and dense and produce bursts of either blue, pink, or white. Two popular varieties include “Hawaii Blue” and “Hawaii Royal.” The plant can stand alone and work well because it produces coumarin which is widely used in commercial insecticides. In addition to smelling nice and adding some extra flavor to your dishes, Rosemary can help reduce mosquitoes. Dry catnip to make toys for your cat and also crush fresh catnip and get rid of mosquitoes. Make your home welcoming for the natural predators of mosquitoes. Setup a bat house and your mosquito population will almost certainly become lower. You can buy a house or make your own. Bats are one of the primary predators of night-flying insects. In addition to eating pesky mosquitoes, they will also consume garden and crop pests, including stink bugs, spotted cucumber beetles, corn ear-worm moths, and emerald ash borers. After attempting an organic garden this spring, I want all the bats I can get! Setting up a bat house can also prevent bats from living in a human’s home. Toads can eat over 100 insects per night. They’ll eat worms, slugs, crickets, grasshoppers, beetles, flies, gnats, and mosquitoes. With these large appetites, why wouldn’t you want to setup a toad-friendly environment in your yard and garden? Toads like moisture, shade, and a safe shelter. You can put a shallow dish or top to a birdbath with some water in a shaded area. You can even go an extra step and make a toad house. Although you can purchase a toad house, you can go the cheaper and more creative route and make one at home. You can use gourds, such as the one pictured here by Gourds by Mary, or you can use clay pots. 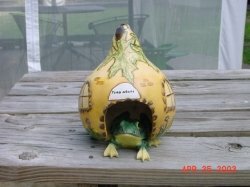 Check out this thread on All Things Plants for directions on how to make these cute toad houses. If you don’t want to cut a hole into the pot, you can also put it on its side and bury it partially in the ground. By burying it partially, you allow the toad to have a digging area to make it more comfy. You want an opening that is large enough for the toad to fit, but not so large that a predator can reach the toad. Another option is to arrange flat rocks, keeping a small space underneath. If you want something that will stay in place, you can use concrete and then put the rocks on top so it looks more natural. You will want to place the toad house in a shaded area that stays moist. Some options include underneath a bush, near a gutter downspout, air-conditioner drip area, or in any shallow area that collects rainwater. You can also put out a solar powered yard light near your toad house to attract insects. Remember to try to avoid lawn and garden chemicals. The skin of toads is highly permeable and chemicals can easily kill toads. Two genera of mosquitoes, Aedes and Ochlerotatus, prefer dark colored clothes over white, khaki, green, or yellow. According to studies, not all mosquitoes seem to have a color preference, but just in case, you should try to wear light colors over dark colors. The chart to the right shows the level that mosquitoes are attracted to clothing color. Have you found any helpful ways to get rid of mosquitoes? Thanks for the tips! I live on a pond and have lots of mosquitos too. I generally just stay indoors to avoid them, which isn’t always the most fun! Good article/advice. We have had an influx of mosquitos and I shall try some of these ideas. I like the toad houses too! what about white? are mosquitoes less attracted to white?